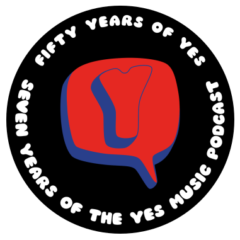 The seventy-fifth episode of the Yes Music Podcast featuring an interview with Scott O’Reilly, author of ‘Yes and Philosophy: The Spiritual and Philosophical Dimensions of Yes Music’. Listen and find out what the book is all about, then let me know what you think by contacting me via any of the different routes on the right hand side or by leaving a comment below! What have the sun and the mythical Uroborus got to do with Yes music? Are Jon Anderson’s lyrics just impossible to understand? Why should you read Scott’s book? Great podcast again Kevin! I rate this as one of your best interviews — probably because I’ve read the book and your questions really addressed the main points in the book as well as the how he arrived at writing it. Scott seemed to really enjoy talking about Yes so it made for a fun discussion. Looking forward to the Brislin interview next week. Thanks Fred! Great to hear you enjoyed it and glad I managed to ask a few sensible questions! I hope you do enjoy Tom Brislin’s one next week. I could have gone on talking to him for hours – a really great guy.